"Summer Fling" watercolour, 9" x 12" purchase here. I just sent out my fall newsletter, which includes my class schedule for September. I'll be teaching watercolour classes starting September 10th, and am looking forward to meeting a great new class of students. One of my favourite things about teaching is the fantastic people I get to know through my classes! Subscribe to my newsletter by filling out the "Sign Up Today" box at right, and contact me if you want to join my painting class this fall! If you're not a Peace River region resident, don't despair! This year my YouTube channel has grown both in videos (with nearly 100,000 views on my channel) and subscribers (I have 821 subscribers), and I've enjoyed adding new painting videos on a semi-regular basis. I'll be adding a demonstration featuring my "Summer Fling" painting above if you like to watch a painter in action, or check out one of my how-to's or "how-not-to's"! 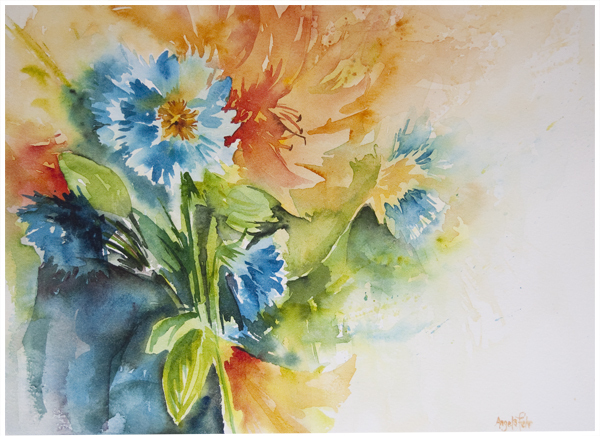 "Summer Fling" was a delight to paint, and when I started painting the vibrant turquoise cornflowers, I had no idea that they were about to be joined by a spray of lilies that just might steal the show! The decision to make the blue "pop" with the addition of a complementary shade of orange resulted in this lovely surprise, and "Summer Fling" just might be my favourite summer painting - so far. Summer isn't over, yet!